What bad things can you say about these movies? Looking at the corniness that it started from, you can’t expect anything more. You go into it knowing what you’re gonna get. You’ve known for 6 movies already. Furious 7 picks up a little bit after where Fast & Furious 6 left off–but also subsequent to the events of Tokyo Drift. 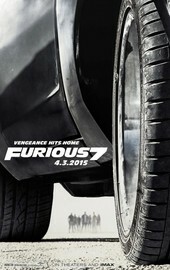 Deckard Shaw (Jason Statham) is trying to pick off members of Dominic Toretto’s (Vin Diesel) crew one by one. He wants revenge for the critical state they left his brother, Owen (Luke Evans). His methods seem a little extreme, given that his brother wasn’t actually killed. But nonetheless, that’s the catalyst for our story. With the huge hype behind this film we all want something big. It definitely serves us well in that respect. The actions sequences are impressive and the story is intricate. While the gang isn’t helping save the world or anything, the personal repercussions will be catastrophic if they don’t end Shaw before he ends them. That’s the major theme in this movie–protecting family. You don’t find out anything new about the characters’ depths besides their individual reactions to the impending fate of Paul Walker’s character. From start to finish this film has tons of energy. It’s long, but never drags. And being a big fan of the franchise, I didn’t want it to end. There are a lot of subplots going on at once, but the narrative doesn’t make it confusing at all. These films aim to entertain. That’s what they’ve always been about and that’s why we love them so much. And as long as they continue to do this we’ll be coming back for more. Walker’s face is seen as computer generated in several scenes of the film. CGI versions of an actual human have never been perfect, but this is perhaps the best attempt I have seen to date. The first time it happened, it took me a second to realize that it wasn’t really him. The film deals with the death of Walker in a very emotional way. Many wished to see his character die as a proper closure, but I think that may hit too close to home for the people involved with the movie. But we get a nice tribute to everyone’s favorite street racer.